Our dominican friends “Neffy” & “Verdugo” released a new reggaeton song called “Tu Mujer Ta En Mi”!! Club “Changos”, Frankfurt / Germany. Friday, April 2nd. 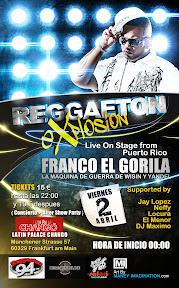 Also performing: Franco el Gorilla, Monkey Black, Verdugo, etc. Reggaetone from Santo Domingo, Republica Dominicana.